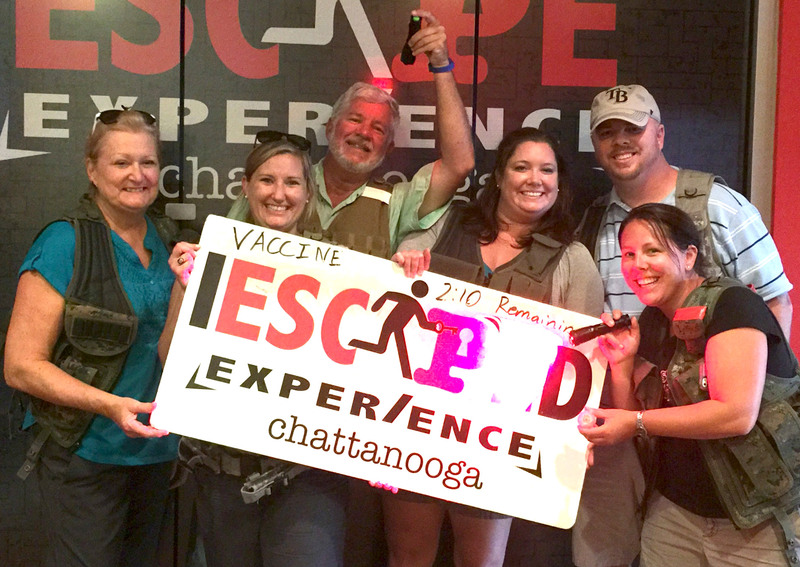 The Chattanooga-area tourism explosion is growing louder. Of course Dayton’s work attracting major fishing tournaments has added major tax dollars in Rhea County, although some of it spills over into Hamilton County. Most recent estimates say nearly 3 million out-of-towners come to visit Hamilton County every year. Most of those folks aren’t fishing. And even those who are fishing, have families that are looking for other “touristy” things to do. Many of them turn to the Internet, and the well-known website called “TripAdvisor.” Users can rate and review their experiences and TripAdvisor sorts them out to help recommend the best “Things to Do” for virtually every city. Click on “Things to Do” in Chattanooga and not surprisingly, the Tennessee Aquarium ranks first. The Aquarium and other attractions spend millions on marketing and advertising. But a very short distance down the list are a few small businesses that are obviously making big waves among Chattanooga tourists. One is called “Escape Experience,” a “real-life interactive adventure.” Groups have 60 minutes to find clues, decode messages and solve problems to unlock the door to freedom. However all the escaping occurs indoors, and in addition to fishing, this area is well-known for its other “outdoor” opportunities. Tops among TripAdvisor’s “Outdoor” activities is the relatively new Amped Super Sports, a simple, one-man operation taking visitors on “high energy” off-roading adventures. Amped Super Sports opened in April 2014, but recently upgraded to new property and new trails. 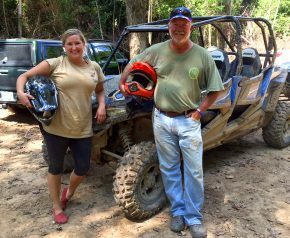 Renner provides Polaris RZR off-road vehicles that visitors actually drive themselves on steep (sometimes very steep) mountain trails. Renner uses that “high-energy” phrase a lot. Once you ride, or drive, one of his off-road vehicles up the side of a mountain, you understand why. 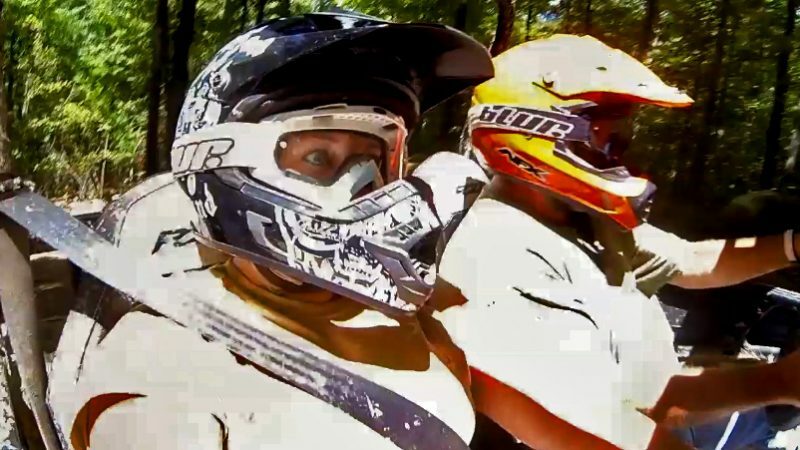 Nobody drives or rides until they have a serious safety briefing from Renner (including a liability waiver), and gearing up with high-dollars helmets, goggles and engaging all seat belts in the roll-bar equipped ORV’s. Then you start up the mountain, following Renner in his own ORV, trying to keep up. The first few minutes your brain is telling you that “motorized vehicles aren’t supposed to do this. The RZR’s are very much like driving a car (with an automatic transmission). A beginner can become comfortable driving in mere minutes. And it’s true. Once in driver’s seat you realize that these ORV’s are built for “high energy” terrain and speeds. Renner leases 170 acres of a mountainside in Marion County, near the Martin Springs Exit off I-24, about a 30-minute drive from downtown Chattanooga. A 2-hour adventure with Amped Super Sports costs $98 per person ($68 for 17 & under, who can’t drive the ORV’s). Right now his leased property is crude. Bathrooms are located behind the nearest tree. After you get wet and muddy on your ride, the changing room is the back seat of your car. The fun is on 4-wheels, not in the amenities. Renner hopes to change that. He also hopes to add overnight camping trips to his menu. But for now, he settles for 72 TripAdvisors who all ranked “Amped Super Sports” five stars.